BenQ W6500 review | What Hi-Fi? 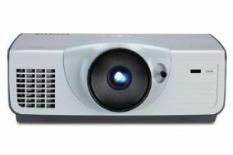 Home cinema projectors are available for far lower prices than you would have had to pay a few years back. So, a £2400 outlay on a projector, as requested by BenQ for the W6500, demands a high-quality set-up and performance in return, not least as competition is fierce at the £2k mark. This model certainly gets off to a flying start. It's on the bulky side out of the box and no looker, but the all-important set-up procedure is a doddle. A joystick on the front of the unit lets you position the picture exactly where you want it, while the familiar zoom and focus features on the lens allow you to apply the finishing touches. The on-screen menus are clear and easy to navigate and allow plenty of picture tweaking, should that be your thing – and it really should be if you want to get the best from this unit. With a film mode, dynamic black setting, clear picture processing and adjustments for individual colour hues, there's plenty to experiment with. We tended, as often the case, to prefer things ‘off' but it's worth investigating. Two HDMI inputs, component, S-video, composite and a PC connection complete the package. Watching the opening scenes of Harry Potter and the Order of the Phoenix, which offer some great picture tests, there's good insight, with attention to detail on faces and natural skin tones – the latter testament to a nicely balanced colour palette. Black levels aren't quite as capable, however, with blocks of dark lacking solidity and introducing some noise. Expansive landscape shots on the Robin Hood disc once again reveal plenty of detail, but as the camera starts to pan our main bugbear with the W6500 is revealed: motion processing. No matter what we do, we can't find a motion setting we're happy with, the picture losing stability and appearing blurred with fast-moving action. So despite a strong start thanks to an easy set-up procedure, impressively natural colours and good detail, its issues with motion means it can't fully justify the price.